Metalsmithing is typically defined as the practice (or art!) of forming and fabricating metal into jewelry. Metal jewelry making isn’t limited to precious metals like gold, silver, and platinum, but can include a variety of both ferrous metals (metals that include at least some iron) and nonferrous metals (metals that contain no iron), including copper, aluminum, steel, tin, titanium, and brass. While most commercial jewelry is crafted in gold, silver, and platinum, artisan jewelers and metalsmiths typically work more with silver and copper, some gold, and a little brass and bronze from time to time. Join the Metalsmith Essentials revolution and learn how to make your own fabricate metal jewelry pieces! Master metalsmithing basics as you boost your jewelry-making skills with these essential techniques for getting started with metal, including how-tos in sawing, filing, hammering, forging, and much more! In addition to the metals required for metal jewelry making, certain metal jewelry supplies are required, including hand tools like saws, files, hammers, metal stamps, daps and punches, disc cutters, texturing tools, and anvils. Machine metalsmithing tools like tumblers, buffers/polishers, Dremels, flex shafts, and other rotary tools are also used in metal jewelry making. Annealing: Before most metal fabrication tasks begin, soften hard metal by heating it in the flame of a torch to make it more malleable and easier to work with. Metal usually work hardens as it is hammered, bent, etc., so it must be annealed again throughout the metalsmithing process. Cutting, drilling, and sawing: Metal can be cut with a jeweler’s saw, tin snips, other cutting pliers, drilling attachments on flex shafts, disc cutters, or metal punches. Filing and sanding: After cutting metal, the edges should be filed with metal files and/or sanded with steel wool to remove sharp edges and dangerous burs left on the metal. Some amount of filing and sanding is also necessary later in the process, such as when trying to fit two pieces of metal together or when trying to create perfectly snug seams before soldering. Forming: Forming metal involves turning flat metal sheet into three-dimensional shapes for metal jewelry, using methods like dapping/doming, raising, fold forming, chasing and repoussé, swaging, fluting, etc. Most all of these methods require hammering metal into or against a hard surface like a bench block, mandrel, anvil, stakes, or in dapping blocks. Metal will work-harden during hammering and will most likely need to be annealed to continue. Joining: Metal can be joined via cold connections (such as riveting, weaving, with screws or tabs, etc.) or hot connections (soldering and fusing). Soldering involves creating a (hopefully) permanent join between two or more pieces of metal using solder (a metal alloy) and a torch. Finishing: The final or near-final steps in metalsmithing are finishing steps like sanding, filing, polishing, and buffing, to create smooth, comfortable, attractive pieces of hand-crafted metal jewelry but also to add the desired finish on the metal surface, such as a matte or shiny finish. Finishing tasks can be completed by hand or by machine, or by a combination of the two. Metalsmithing extras: At some point during the metal jewelry-making process, you might choose to embellish your metal designs by adding textures and patinas. Texturing metal can be achieved by hammering with texturing hammers, hammering against a textured surface, engraving, etching, rolling metal sheet through a rolling mill, reticulation, etc. Adding patinas can involve using chemicals like liver of sulfur, household concoctions like vinegar and salt, or simple paint-on patina solutions, etc. 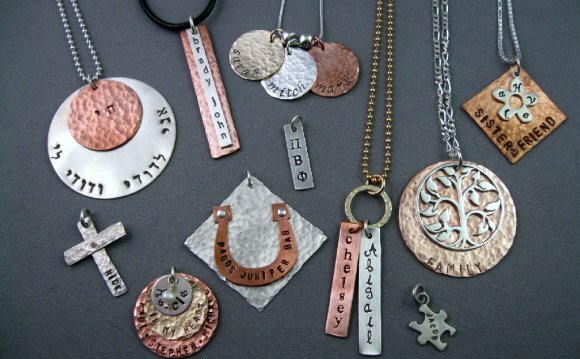 Metal stamping is another “bonus” metalsmithing technique that allows for personalization of metal jewelry by stamping on words, letters, designs, or simple patterns using steel stamps and a hammer. This is a very basic outline of what it means to make metal jewelry using metalsmithing techniques, but breaking down a new hobby into simple terms and steps is a great way to get started! One of the many things I love about metalsmithing is you can dabble or go “whole hog” and still enjoy a very rewarding, fun hobby. For example, if you’re intimidated by using a torch, just skip it; you don’t have to solder to make metal jewelry, just use cold connections. If machines are worrisome or seem too expensive, skip them! Anything you need to do to metal to make metal jewelry, you can do by hand, without any electricity or machines. That’s the way a master metalsmith did it thousands of years ago, after all. With basic (and familiar) tools like pliers, tin snips or a saw, and hammers, you can be well on your way to creating artistic metal jewelry.